Time Machine Video Slot Guide & Review - Casino Answers! Time Machine is a 5-reel, 25-line video slot developed by Cryptologic, featuring a wild substitute symbol, scatter wins, multipliers and a free spins feature. You can play the Time Machine video slot at [Americans: Unfortunately due to legal restrictions you are unable to play at any of the online casinos this game is at. We recommend you trying playing the unique slots at Win A Day Casino instead.]. Bets on the Time Machine slot machine are $0.01, $0.02, $0.03, $0.04, $0.05, $0.10, $0.15, $0.20, $0.25, $0.50, $0.75, $1, $2, $3, $4, $5, $6, $7, $8, $9 and $10 per line. 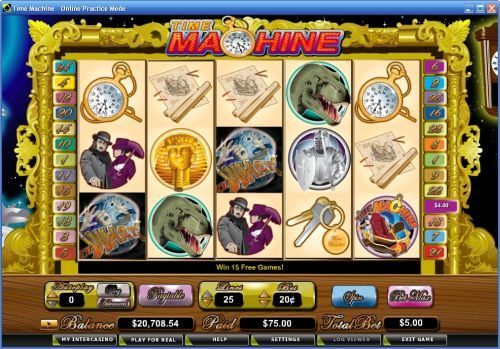 You can select from 1-25 paylines on a spin on the Time Machine slot game. You can bet as little as a penny per spin on Time Machine up to the maximum total bet of $250 per spin. The betting range is very wide, so no matter if you are a high roller or a casual player, you will be able to find a bet suited to your liking. You can choose between Normal, Fast and Very Fast game speeds. 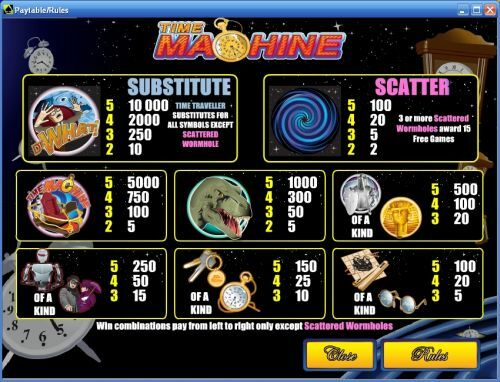 To play all 25 lines on the Time Machine slot game, use the “Bet Max” button. For all other bets, first select your bet and then hit the “Spin” button. The highest paying symbol on the Time Machine online slot is the Time Traveller symbol. If you hit 5 of a Kind on a selected payline, you will win the 10,000 coin top jackpot. The Time Traveller symbol is wild and will substitute for all symbols except for the Scattered Wormhole. The Time Traveller symbol comes with its own special animation and sound effects. Other high payouts on the Time Machine slot include the Time Machine symbol (5000 coins) and Dinosaur symbol (1000 coins). The Wormhole is Time Machine’s scatter symbol. 2, 3, 4 or 5 Scattered Wormhole symbols will win you 2X, 5X, 20X or 100X your total bet. If you hit 3 or more Wormhole scatter symbols, you will win 15 free spins with a 2X multiplier. The free spins feature can be re-triggered. The free spins feature is an excellent way to win a lot of cash when you play the Time Machine slot game at [Americans: Unfortunately due to legal restrictions you are unable to play at any of the online casinos this game is at. We recommend you trying playing the unique slots at Win A Day Casino instead.]! You can use Time Machine’s autoplay mode by selecting up to 999 autoplay spins and hitting the “Play” button. You can also hit the “Advanced” button to access its advanced features. You will be able to select stop settings including cumulative win or loss of up to $5,000, single win of up to $5,000 or upon completion of free games. You can stop the autoplay mode on the Time Machine video slot at any time. Time Machine seems to be a little behind the times when it comes to special features, but still it has an interesting theme. While the theme is interesting, more can be done with it (such as in the A Switch in Time iSlot). You can play the Time Machine video slot when you sign up and make a deposit at [Americans: Unfortunately due to legal restrictions you are unable to play at any of the online casinos this game is at. We recommend you trying playing the unique slots at Win A Day Casino instead.]. Can players from the United States play the Time Machine video slot for real money? American players are unfortunately unable to play the Time Machine video slot for real money. On the plus side, they can play the excellent A Switch in Time iSlot at Rival casinos such as Bovada. Can I play an Instant Play version of Time Machine for free? You can play an Instant Play version of the Time Machine video slot at Cryptologic online casinos such as [Americans: Unfortunately due to legal restrictions you are unable to play at any of the online casinos this game is at. We recommend you trying playing the unique slots at Win A Day Casino instead.] for real money only. If you experience any issues with the Instant Play software, make sure you have the latest version of Adobe Flash Player installed on your computer. Where can I play more time travel-themed slots? We are listing all of the time travel slot games in our list of Sci-Fi slot games.